WHAT IS A YOGURT STARTER? 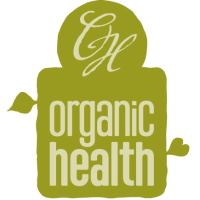 A yogurt starter is a carefully balanced blend of bacteria which consume lactose. This blend of bacteria converts the lactose in milk to lactic acid, giving yogurt that classic, deliciously tangy taste. Lactic acid production lowers the pH of the milk, which allows yogurt to be stored longer and changes the protein structure, giving yogurt its texture. Each yogurt starter has a unique blend of bacteria, which produce different flavors and thicknesses. As mentioned above, the characteristic tangy taste of yogurt is due to the acidificationof the milk during fermentation. 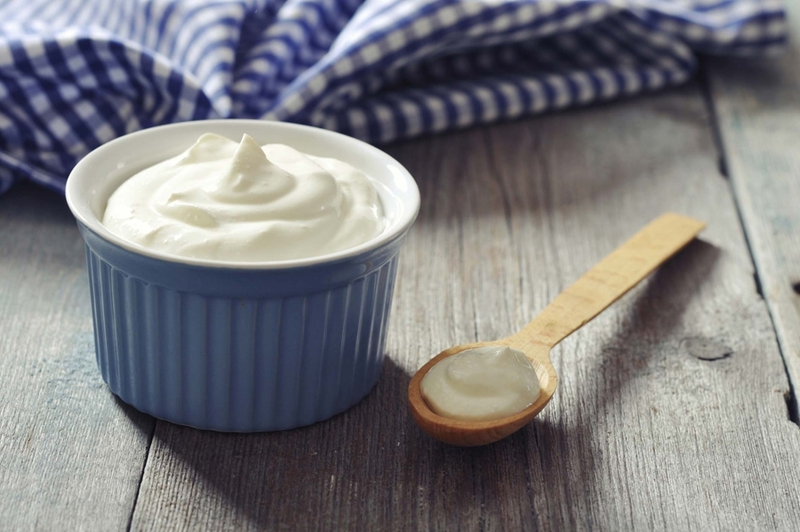 The flavor of yogurt can range from mildly sour to quite astringent and varies with the culture used and the length of culturing time. A longer fermentation time usually yields a tarter flavored yogurt. 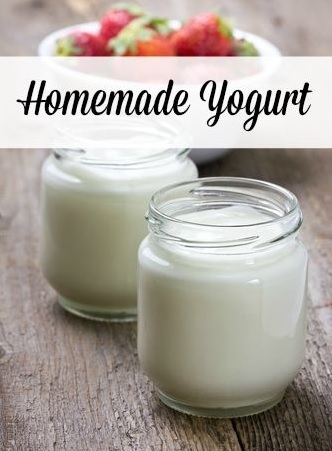 Homemade yogurt's thickness and texture can range greatly. The culture used, the culturing temperature and time, and the type of milk used all contribute to the consistency and texture of yogurt. 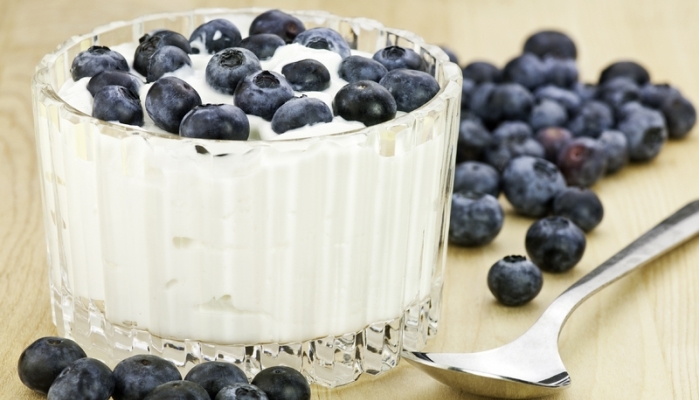 Yogurt may be thin enough to drink or thick enough to hold its shape on a plate. For a very thick, Greek-style yogurt, draining whey is necessary. Yogurt can also be ropy, creamy, or gelatinous. These variations are due mostly to the type of bacteria in the culture, which you can learn more about in our comparison chart below. Set up.a. Clean and sterilize your equipment, tools, and work surface. There are two ways to do this: Use the “sanitize” setting on the dishwasher, or sterilize everything with boiling water. Set out all the equipment for easy access. b. Prepare an ice bath. Simply fill the large bowl or (clean!) sink with ice. c. Set up the candy thermometer. Attach it to the heavy, large pot. The tip should be low enough to be covered a bit by the milk, but should not touch the bottom of the pan. Cool the milk.a. Once the milk reaches 82 degrees, remove it from the heat and allow it to cool to 43 or to 46 degrees. b. To speed the cooling process, place the large pot in the ice bath, stirring the milk occasionally. If the milk temperature drops below 110 degrees, return it to the heat. Add the starter. 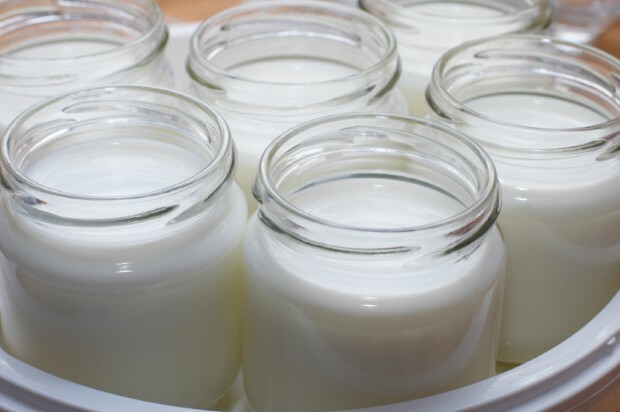 Once the milk reaches between 43 and 46 degrees, it’s time to add the starter culture.a.For yogurt starter:In the small bowl, combine about 1 cup of the warm milk with the yogurt and stir to combine. Add the yogurt-milk mixture to the pot and stir gently until completely incorporated. b. For powdered starter:Follow the manufacturer's instructions! 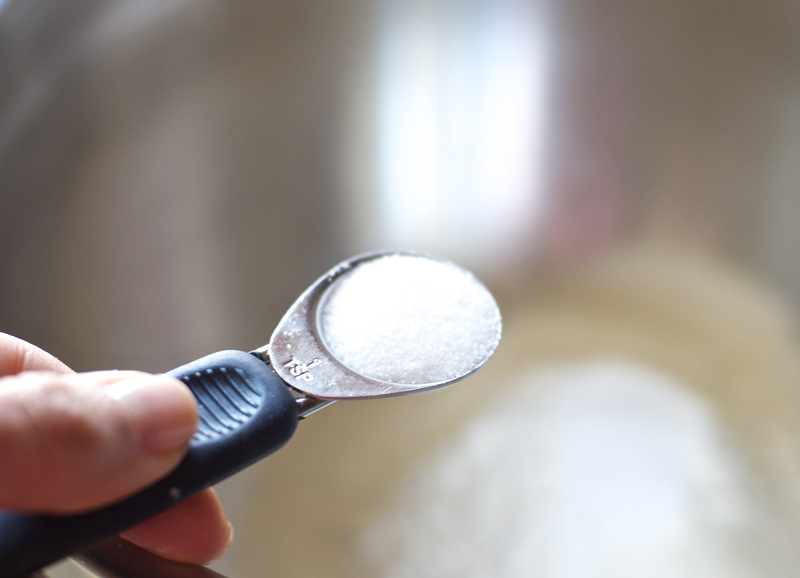 This will involve adding the specified amount of powdered culture to the warm milk, and whisking gently until the powder has dissolved completely. Note: If using thickeners, add them now, too! To thicken: Whisk in 3 or 4 tablespoons of nonfat powdered dry milk. Or, if using pectin or gelatin, just follow the instructions on the package. Get prepped for incubation.a. First, pour or ladle the warm mixture into a thermos (if going with that method), or a covered heat-safe container (if using the microwave, oven, or crock pot method). b.During incubation, you’ll want to keep the mixture at a temperature of 46 degrees Note: If the milk’s temperature drops below this freshold during incubation, it should still be fine; your yogurt just might have a looser texture. Now it’s time to incubate.a. If using a thermos: Simply warm up the inside by swirling around hot tap water inside before adding the yogurt. (Pour out the water first, obviously!). Wrap the container in a towel or blanket and leave it somewhere that it won't be disturbed. b. If using the oven: Warm the oven to about 115 degrees (if your oven doesn’t have a low temperature setting, just set it to the lowest temperature possible and allow it to heat up for a bit). Turn the oven off. Set the container in the oven. c. If using a crockpot: Heat the crockpot to 46 degrees, then unplug it. (If it only has high and low settings, just use one of them to get the pot warm, and then turn it off.). Wrap the yogurt-filled container in a towel and let it sit, covered, inside the crock pot. d. If using the microwave: Cover the bowl and swaddle it in a few towels to help retain heat. Pro tip: If you have a heating pad, feel free to heat it up and put it underneath or beside the container to further ensure it stays warm. e. If using a heating pad: Set the heating pad to low heat and wrap it around the container, or set the covered container on top of the heating pad and wrap a few towels around the container—the goal is to distribute the heat as evenly as possible around the yogurt. This option might be a bit slower than the others; don’t be shocked if the yogurt needs to sit for upwards of ten hours. Let it set. Five hours is the minimum amount of time required for incubation, but you can safely incubate for longer—even overnight. The longer the incubation period, the thicker and tarter the yogurt. After five hours, the yogurt is basically “done” when you want it to be. The texture should be creamy, and the flavor will be tart. Take a taste! If you like it, stop incubating. If you’d like it to be tangier, let it incubate for a few more hours. If you want the yogurt to be thicker, follow the instructions in step #9 once you’ve finished incubating. Note: Do not disturb or jostle the yogurt during incubation. Strain the mixture (optional). Now, if you want to make a thicker, Greek-style yogurt, follow these steps (if you want to keep it traditional, skip to the next step!). For thicker yogurt: After incubation, spoon the yogurt into a cheesecloth-lined colander set over a bowl Cover with plastic wrap and let it drain in the refrigerator for at least one hour or overnight (probably closer to overnight). If you want extrathick yogurt—think Fage- or Chobani-esque—use a double layer of cheesecloth or a coffee filter, and allow the mixture to strain overnight. Discard the whey that drains out of the yogurt (or reserve it for another use!). Add flavorings (optional). After the yogurt has fully set and cooled, feel free to add flavorings and mix-ins! Or, store plain and top with extras right before serving. The yogurt should last for approximately two weeks, though it will have the best flavor during the first week and will become more tart as it ages. If more whey separates out of the yogurt while it’s in the fridge, just stir the whey back in before serving. Enjoy!